At the time, we postulated on the PCIe lane allocation, as ASRock had said that this was possible with only one PLX 8747 switch, whereas on the Z77 Extreme11 they had used two. It all comes down to the LSI 3008, which requires eight PCIe lanes by itself. 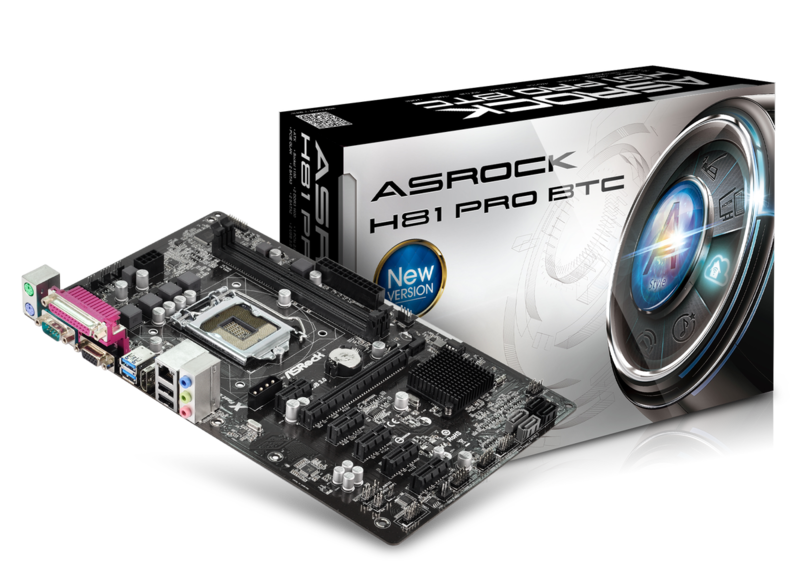 Since that iteration, ASRock have also added Thunderbolt 2 into the mix, using a controller that requires 4 PCIe lanes to give two TB2 ports. This also goes along with four-way SLI and Crossfire, suggesting that using switches they are able to supply x8/x8/x8/x8 to the GPUs, another x8 to the LSI chip and x4 to the TB2 controller. Without getting the board on hand, I would assume that the motherboard disables part of the PCIe slots in order to use Thunderbolt 2. 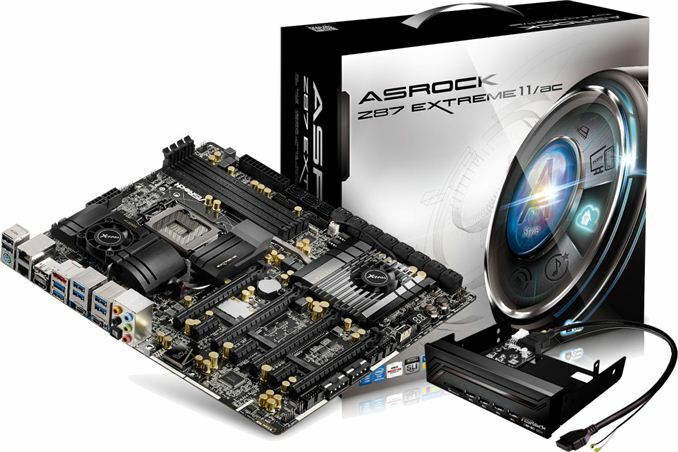 The Z87 Extreme11/ac also comes with dual band 2x2:2 802.11ac (ASRock tend to use the Broadcom controller), a Wi-SD box to improve wireless range (also provides four front panel USB 3.0 ports and an SD card reader) and Purity Sound, ASRock’s name for their Realtek ALC1150 audio codec solution. Given the image above, we also see a total of 12 USB 3.0 ports, dual NICs (Intel), two mSATA ports (shared with chipset SATA ports) and an eSATA port. Pricing has not yet been announced, but the previous Z77 Extreme11 was $600. That had two PLX 8747 chips whereas this only has one, but there is TB2, extra USB 3.0 controllers, dual NICs and dual band 802.11ac WiFi, so I would hazard a guess that it might be in that $400-$600 price range. 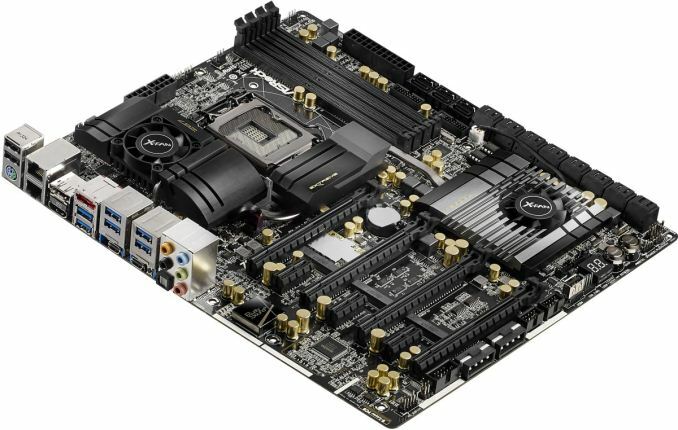 The idea behind these boards is simple: a very cheap motherboard with a cheap dual core CPU and minimal power delivery, the board is designed to accommodate multiple graphics cards with x1 to x16 risers. 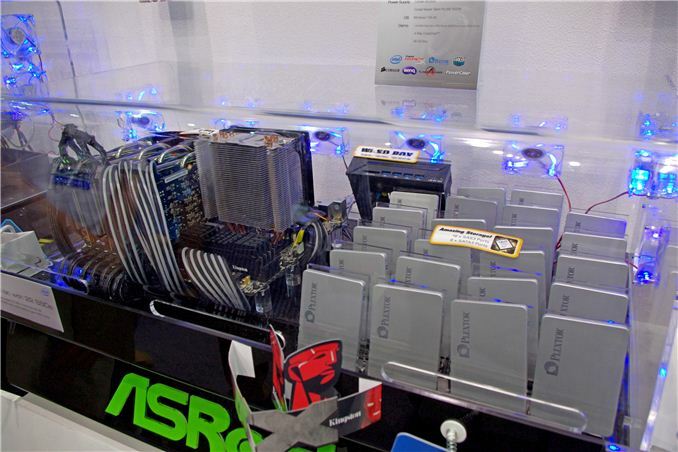 ASRock claims these boards are able to support six GPUs for mining. There is one caveat though. For Bitcoin, GPU mining is almost dead, offering little return unless the price of Bitcoin rises a lot. This is due to the advent of ASICs that offer more mining capability for less power. There is still money to be made from Litecoin, which is somewhat buffered by the ASIC revolution, although for my GPU collection I would currently be earning $10 a day (after electricity bills) for 2000W+ of GPU noise and heat. Some might call the BTC boards a little too late, whereas due to the rises we are seeing today, that might not always be the case. There might have been potential for these systems had ASRock supplied the system full of USB ports instead of the parallel/com/vga port combination as shown in the images above. 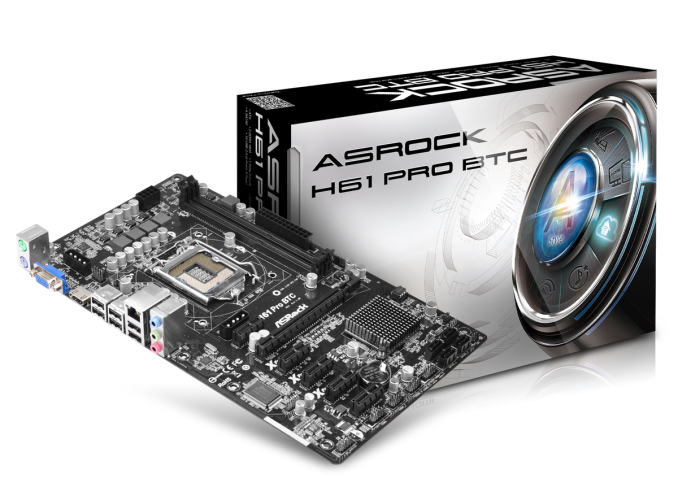 As always, despite what ASRock PR might have you believe, I would like to add a disclaimer: there is no guarantee that Bitcoin mining (via ASIC or GPU) will generate a financial return. Only invest what you can afford to lose. 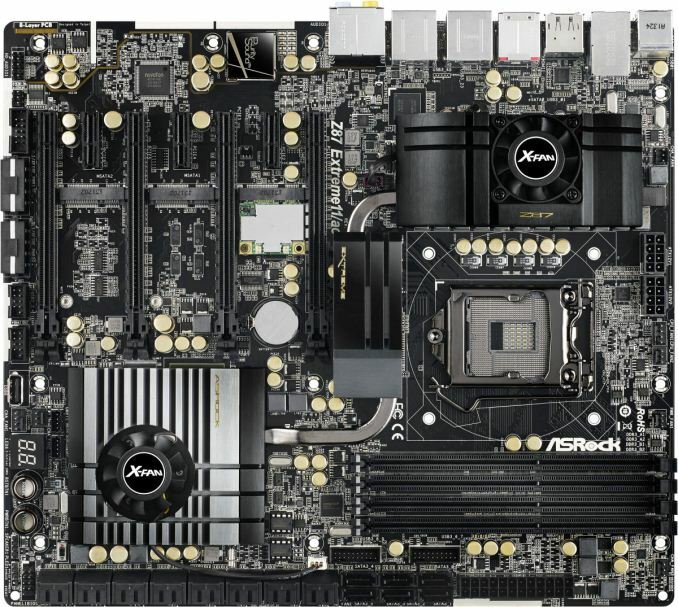 Nevertheless, I would hope that these motherboards would be sold in the $60 or below segment. That seems awfully low for a motherboard, but therein defines the purpose of such a product in the cryptocurrency world. The US Senate is expected to report on Virtual Currency today, which could explain the recent influx of investment into Bitcoin and Litecoin. Is the front panel USB3 device using a hub? I only see a single USB3 cable coming out the back. "This week ASRock are launching"
The distinction is a style choice. Much like data (singular) vs data (plural) and other examples of journalistic prose.